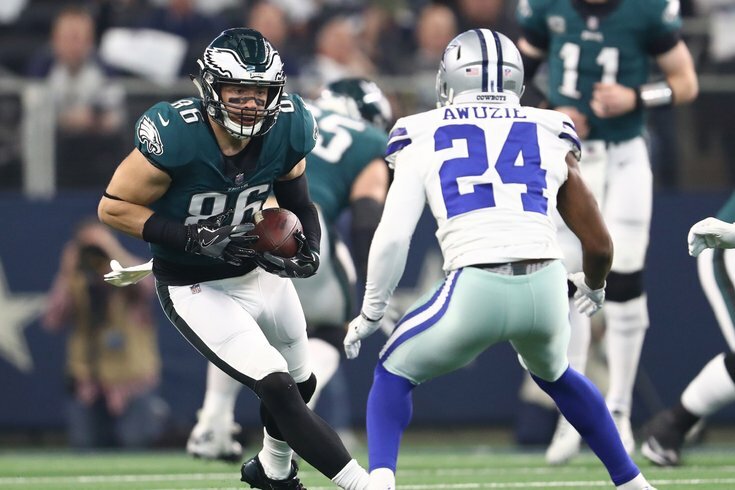 Philadelphia Eagles tight end Zach Ertz (86) runs after a first-down reception against Dallas Cowboys cornerback Chidobe Awuzie. The NFL draft is looming and the Eagles, with seven draft picks and a knack for draft day trades, could be making moves sometime soon. Which means the Birds' current over/under line for wins — 9.5 — could be on the move. Last year, the Eagles suffered through a ton of costly injuries but somehow won five of their last six to get to 9-7 and make the playoffs as a Wild Card team. Sportsbooks expect them to be slightly better this season, with Parx projecting the Birds as slight favorites in the NFC East at +100, over the Cowboys at +140 (Dallas has a 9 win over/under threshold). As we mentioned, betting lines and futures bets are fluid situations, so any development that significantly affects the Eagles roster, or that of a key competitor could move the win total. For what it's worth, we bolded last year's playoff teams — Philly faces just four (Dallas twice). The schedule looks favorable in theory — but the Packers, Falcons, Lions and Vikings are all teams will realistic playoff hopes next season. We'll let you know if the Eagles' over/under win total changes.